It’s a fun and fanciful place that has a flying horse with a cowboy hat as a lamp, and Queen Sally’s Diamond Deli is exactly that sort of place. 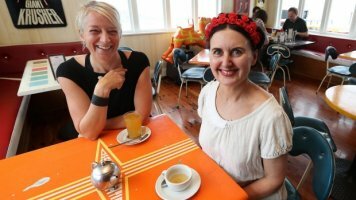 Opened after a fire gutted the nearby Maranui café back in 2009, Queen Sally’s was created to keep the hardworking café team in employment, but nearly ten years on (and with Maranui now well and truly re-opened) this colourful little deli café isn’t going anywhere. With a big emphasis on vegan and vegetarian options, expect to see only two meat options in the cabinet, the rest is beautiful samosas, salads and filled wraps all without the animal protein. The menu tacked to the coffee machine changes weekly, depending on what’s in season and what creative new salads and doughnut flavours the team at the off-site kitchen have come up with, but you can always expect it to be vegetarian friendly and damn delicious. A beautiful mish-mash of high tea meets deli, expect to see plenty of sweet treats as well as preserves to take home. There’s raw slices for those who want something a little more wholesome, although it is hard to turn down one of Queen Sally’s special pink Chelsea buns. Wellington Chocolate Factory, Baron Hasselhoffs, Libertine Teas, Fix and Fogg and a freezer full of Nice Blocks are some of the local creations you can take home, or try some of Queen Sally’s own specialty sauces, chutneys and jams. 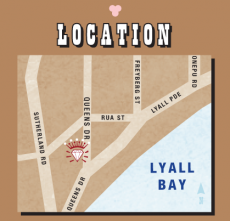 Like stepping back in time to when a local deli was a frequent sight in the neighbourhood, Queen Sally’s is an easy-going reminder of what a café that caters to all looks like. 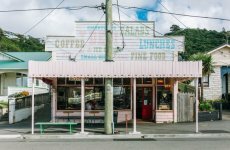 Babies, friendly dogs, schoolboys and local tradies all pop in for their share of warm service, Havana coffee and takeaway lunches from a place that knows how to foster a community vibe.